Why should I pick Wintix and Webtix? Wintix and Webtix were rated among the top preferred software according to surveys from The Arts Management and Technology Laboratory at Carnegie Mellon in 2015 and 2011. We believe one reason is because we used to run a box office and developed the software to help us do a better job. We know the challenges box office people face and designed our programs with that in mind. Since we don’t charge per ticket or per user fees, Wintix is the best value on the market. And the software grows with your organization. It can handle cozy little community theatres, gigantic stadiums and everything in between. At the end of a day, can you run a report by day for all sales? Does it make sense? Can you “browse the report” and correct mistakes as you find them? Can you run a report by show, for a single performance? Are the donors included on the report? Do you charge per ticket or per user fees? Never! Some other companies make it seem like their services are free because you pass the per ticket fee on to the patron. But that is money that could be going into your bank account. Just do the math to find out how much more you could be earning for your box office! Is the software on my computer or in the cloud? That depends. Wintix is our desktop program for in-house sales, and Webtix is our companion program for online sales. If you only have Wintix, the program will generally be installed locally on your computer, though we can host your data if need be. If you have Webtix, as well, Wintix will still be installed on your local computer, but we will host your data on our server. Some large organizations choose the Pro Versions of Wintix and Webtix. In that case, the programs and data are generally hosted on their local server. Most of our customers want to have their data on the cloud. They want Wintix installed on their local computer. Webtix, by nature, is in the cloud already. Your data is always backed up. If necessary, we can do a point-in-time restore to within the last 10-15 minutes. One of the most common questions is, “Why aren’t things going my way. My reports are not correct.” What we can do is log into your data and diagnose the problem. Webtix can easily get to your data so the site responsiveness is very good. With Wintix installed on your desktop, you have access to a big screen, real keyboard and a usable mouse. All the reports and tools are available to help keep track of your sales. No. A lot of other companies require you to sign a contract that locks you in for years. If you decide you don’t like their software, you’re stuck. We do highly recommend that you have a support contract in place, though. A support contract gives you unlimited phone and email support to help you learn how to use the many features of the software, and help you with any issues that may arrive. As an added benefit, you receive a monthly newsletter with valuable tutorials, important update information and other news, as well as access to our online Help Desk. Learn about support options. Can I sell season passes? Wintix allows you to create pre-assigned or flex season passes ….. In Wintix 6, online season patrons can pick their seats for each chosen performance during their purchasing process. Wintix has the capability of rolling over from one season to another for renewal purposes. Wintix provides users the ability to build season packages and print or email tickets and receipts. Wintix tracks donations on season packages as well as for single tickets. Wintix comes with reports to track your season subscribers from one year to the next. Wintix has the ability to email notices for season ticket renewals. Since our software is compatible with software like Constant Contact, you can export email lists into these types of email programs. If you already use an application for merging, you may print out a report from Wintix listing your customer information for exporting to your mail merge document program. Wintix also has batch print capability. Can I take and manage donations? You can take donations in-house and online with Webtix. It’s easy to track donations and donors in Wintix with robust reporting tools and group assignments for solicitation campaigns. If you need intensive donor management, Wintix fully integrates with Fundraiser Software, one of our allied partner organizations. How else can I use the software? You can use it for class or workshop registration, parking passes, selling merchandise – your imagination is your only limit. You also have the ability to create “form choices” where your patrons can select options such as meal choice, etc. What kind of training and support do I get? With a support contract in place, you have access to our expert customer service technicians who not only know the software inside and out, but how to run a box office and a business. And we are always on call after regular business hours for emergencies. Learn about your service support options. You also get access to the Help Desk, our in-depth knowledge base, and our valuable monthly newsletters, which are filled with tutorials and other important information. We offer dedicated training and other system administration/IT services for an affordable fee. While patrons can buy tickets in Webtix 5 on their mobile devices, Webtix 6 is fully optimized across all platforms and gives your customers a great, easy shopping experience. Can we make Webtix look like our website and branding? Absolutely! Webtix is fully customizable so you can match your branding and image. You can even customize the default interface to add performance information, graphics, and choice forms for items like entree selection or performance selections for flex season passes. How do you keep online transactions safe - are you PCI compliant? Webtix versions five and six for online ticketing software do not store credit card numbers, expiration or cvv2 numbers as per PCI and PA-DSS regulations. Wintix and Webtix encrypt credit card information and sends it directly to the secure servers at Authorize.net and Pay Pal gateways which connect to our clients’ respective merchant service providers/credit card processors. 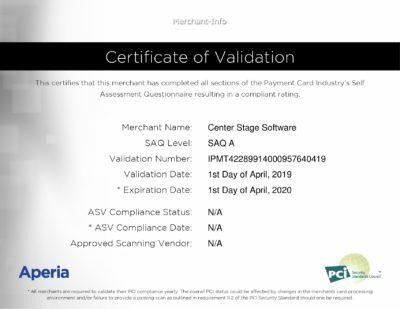 Please click on this link to a Center Stage Software Help Desk post if you would like to read the Comply Assure Site Seal that states Center Stage Software is PCI compliant. Does Wintix have patron management functions or CRM? Don’t be fooled by the sales pitches of some software companies who want you to think you need a big, bloated, sales force driven customer relationship management (CRM) to manage your patrons. Customer management has been built into Wintix with box office needs in mind. You can track how many and what kinds of shows your customers attend, their donation activity, where they live, and many more types of information. Group assignment and email export functions make it simple to create targeted marketing and communications campaigns. Wintix lets you flag patron records and create house manager alerts, and keep detailed contact records of all their purchases and donations. Can we use discounts and limited time offers? Yes. It works differently depending on which version of Wintix you have. With Wintix 6 you can create a specific discount or a percentage discount and set up automatic time limits. You can also offer the discounts to select people, such as members of a fan club. With Wintix 5, discounts work by creating special price categories and time limits are handled manually. Can my customer information be put into Wintix? Absolutely. We install your customer records into Wintix before you begin to use it. If you are upgrading from a previous version of Wintix, all your sales data and seating plans will be transferred, as well. When you purchase the Wintix software, Center Stage Software inputs the first seating plan absolutely free. Additional seating plans are input for a very affordable charge. Costs for additional plans depend on whether the seating plan is a proscenium style, thrust, dinner/cabaret configuration, or is a multi-chart with an interactive graphic. Wintix comes with tools for inputting seating plans and some of our customers do input their own plans. However, it is our experience that our customers have much more important tasks to do than input seating plans. Our staff is very experienced and can input plans at a much faster rate than our users and we have a lot of expertise in how seating plans should be configured both for Wintix and for display in Webtix. What kind of reporting does Wintix have? Wintix has some of the most versatile and robust reporting features in the industry. Each type of report has multiple variables, letting you capture the exact information you need. From daily sales reports, out of balance reports, to run of show reports to customer activity reports, there’s a report for every need and department. You can learn more about your most popular shows, buying trends, patron behaviors, and more. You can also customize your own reports. Due to the complexity involved, Center Stage Software recommends letting us customize reports for an additional charge. Once I decide to purchase, then what happens? Upload your mailing list to us (we can convert overnight your mailing list to our software). Send us your seating plan(s). One is complimentary and any additional plans are charged extra at a very affordable price. Complete the Wintix/Webtix service agreements and the Webtix Rental Agreement. Provide us with your internet speed and latency speeds for internet commerce. Provide us with your payment gateway login/transaction keys. How long would it take to get me up and running? We can generally have you up and running within two to three business days once we receive the above.